Mercedes-Benz E-Class Running Costs, MPG, Economy, Reliability, Safety | What Car? The E-Class is popular with company car drivers, so CO2 emissions are just as important as price. With that in mind, it’s a big bonus that E220 d emissions start from a modest 128g/km – a lower figure than many of its automatic gearbox-equipped rivals can manage, which is good news on the Benefit-in-Kind tax front. However, this virtue has to be weighed against the fact that it’s a fair bit more expensive to buy than most of its rivals. AMG Line trim adds bigger alloys and pushes up CO2 output quite a bit. Astonishingly, the E220 d isn't necessarily the best choice for company car choosers; the plug-in hybrid E300 e expels just 46g/km of CO2 when fitted with 18in wheels. Just remember that it’s more expensive to buy and that you won’t get anywhere near the claimed 148.7mpg unless you charge up the battery from the mains regularly. The V6 E350 d isn’t such a great company car because it pumps out a lot more CO2 than the E220 d. It’s also much more expensive to buy, even though it does compensate with more standard equipment. It’s a similar story with the E53 and E63 S; both will require plenty of feeding and will cost more to insure and tax. Meanwhile, if you’re a private buyer, the E-Class’s relatively slow depreciation will be a big draw, but be prepared to shell out more on servicing than you would for a BMW 5 Series or Audi A6. There are just two trims for regular E-Class cars: SE and AMG Line. The former gets most of the things you’ll want, apart from adjustable lumbar support, split-folding rear seats and, if you’re buying the E220 d, the Comand infotainment system. You’ll probably also want to add metallic paint, if only to protect resale values. The E53 gets more equipment and the E63 adds even more still. AMG Line trim adds lots of sporty design touches, including bigger alloys, a bodykit and a faux leather-wrapped dashboard. Oddly, you also get faux-leather seats instead of the real leather ones that feature on the cheaper SE trim. 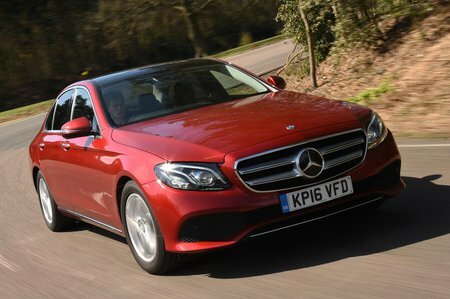 Euro NCAP awarded the E-Class a five-star safety rating. All versions come with active safety equipment including automatic emergency braking, which alerts you to potential frontal collisions with cars of pedestrians and applies the brakes if necessary. Seven airbags and an active bonnet to help protect pedestrians also come as standard. The optional Lane Tracking package brings blind spot-monitoring and active lane keep assist, and the Driving Assistance Plus package adds all the features of the Lane Tracking package along with some other advanced safety aids, including adaptive cruise control. Thatcham Research has given the E-Class five stars for fending off car thieves and four stars for resistance to break-ins. An alarm and an immobiliser come as standard.